Now personally, I think a well organized space leads to productivity and less stress. So, I highly recommend having a place for everything. Like, ev-er-y-thing. Paperclips and pencils to reference manuals and craft supplies, make sure it has a place and better yet, it’s labeled. You want to make sure that you’re not the only one who knows how to get around the space. You can use simple drawer organizers, decorative boxes, bookcases or filing cabinets. There’s no wrong way to do it. Think about using cute chalkboard labels or stickers you can write on to identify what's in those boxes, cabinets, etc. Find a way to make your organization method stylish and unique, like you. Use fun colors or printed designs on your boxes, or wire baskets on the walls. Whatever fits your style and helps you use your creative juices. Sometimes working from home means converting a once bedroom into an office, a whole room with a door! Other times it’s just finding a corner in an already maxed out space. If you are one of the many that have the latter option, here’s a tip for you: Use your walls! Having a functional space is not indicative on square footage. Shelves to the ceiling can help free up room to move around. And putting message boards and file holders strategically placed in front of your desk can create a gallery wall effect. If you’re like me, not all your best ideas come flooding in the second you sit down to work. That’s why I’ve found ways to fit in bits of inspiration here and there. For me it’s pictures of my family and scripture but it can appear in many ways. The key is to find something that reminds you of why you’re doing what you’re doing and how to keep going. We talk a lot about color as designers and it’s just as important for an office as it is for a bedroom. I personally think blues and greens are the best for an office as they help calm the space and give a bit of subtle energy. 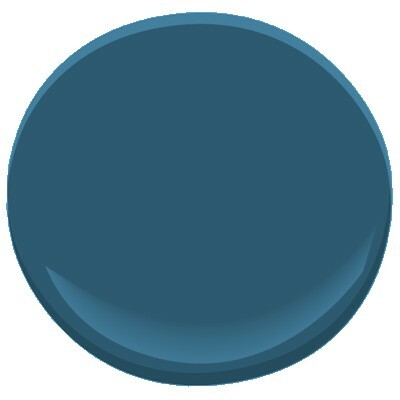 I chose a blue with a hint of purple for my office but I also really like Woodlawn Blue and Palladian Blue by Benjamin Moore. Now for the exception to my suggestion above. If you have a well lit space, light furnishings and want a bit of pizazz to fuel the creative energies, I like the idea of picking a darker, more bold color. And of course, I still like blues. Try one of Benjamin Moore's color picks from 2015. Plants. I love ways of bringing nature inside and houseplants are both decorative and functional, in every room of the home. Did you know that NASA did research on which plants have the best “bad air absorbing qualities”? You can check out their findings here. If you want your plants to be easy maintenance, I suggest the Areca Palm, Money Plant or maybe a table top Variegated Snake Plant. Lighting plays a huge role in designing a space and boy are there a lot of options. You won’t always have an office that lets in the perfect amount of light at all hours of the day. Or maybe you work at night?! So consider adding an additional table/desk lamp and perhaps a floor lamp or pendant light for additional help on the not so sunny days. Or if you live here in Michigan, September through May. This last idea may not apply to everyone (if you’re the one sitting in a chair in the corner of your living room) but it is still something to think about. Window treatments are often the last thing people think about when finishing a space which means they often get picked in a hurry or pinched out of the budget. I’ve yet to meet anyone that can work long term with a glare on their computer screen or sun in their eyes, so consider using a roman shade to soften the space. If you want more light control options, try using a wood blind with curtains, it's what I did. Hopefully this list gives you a little push to make that home office more than just a desk and a chair!